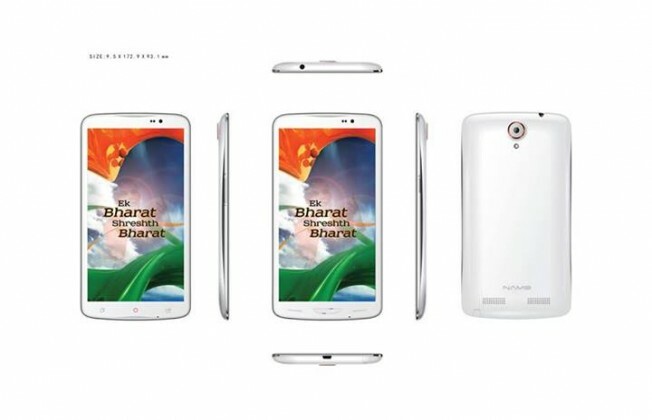 The team behind the upcoming Smart Namo smartphone is now developing a Narendra Modi-branded phablet too. On their Facebook page, Smart Namo has announced the specifications of this upcoming tablet, titled Smart Namo Phablet with 6.5-inch display. A couple of days back this group had announced to dedicate not just a phone named SmartNamo but a whole series of mobile devices including feature phones to the minister by launching these in his name. In terms of features, this phablet will have 6.5-inch full HD display with 1920×1080 pixels resolution. The phablet will be powered by a 1.5GHz quad-core MTK6589T processor with either 1GB of RAM or 2GB of RAM. It is expected to launch in two variants – with 1GB of RAM with 16GB of internal memory, and with 2GB of RAM with 32GB of internal memory. It will also feature expandable memory support for up to 32GB by using a microSD card. Device will run on Android 4.2.1 Jelly Bean which will be upgradeable to higher versions. Other features will include a 13-megapixel camera and 2-megapixel front camera, and light, proximity, and gravity sensors. For wireless connectivity, there will be 3G, Wi-Fi, Bluetooth and GPS support. The price of the latter is said to be Rs 21,111. The minds behind the Smart Namo project are businessmen who hail from Gujarat and run a phone business in China. The word “Namo”, both in the name of the group and the products, stands for Narendra Modi as well as Next Generation Android Mobile Odyssey, the group’s official website reveals.